Compact Office worker. The successor of the Vostro 3450 (Sandy Bridge, AMD Radeon HD 6630M) comes with an Ivy Bridge CPU and Nvidia's GeForce GT 630M GPU. Our review shows whether the Vostro 3460 can outperform its precursor using this combination. Dell's Vostro range offers relatively low-priced office laptops for small businesses as well as home users. In summer of 2012, Dell released the new models from the Vostro 3000 range based on Intel's Ivy Bridge platform. 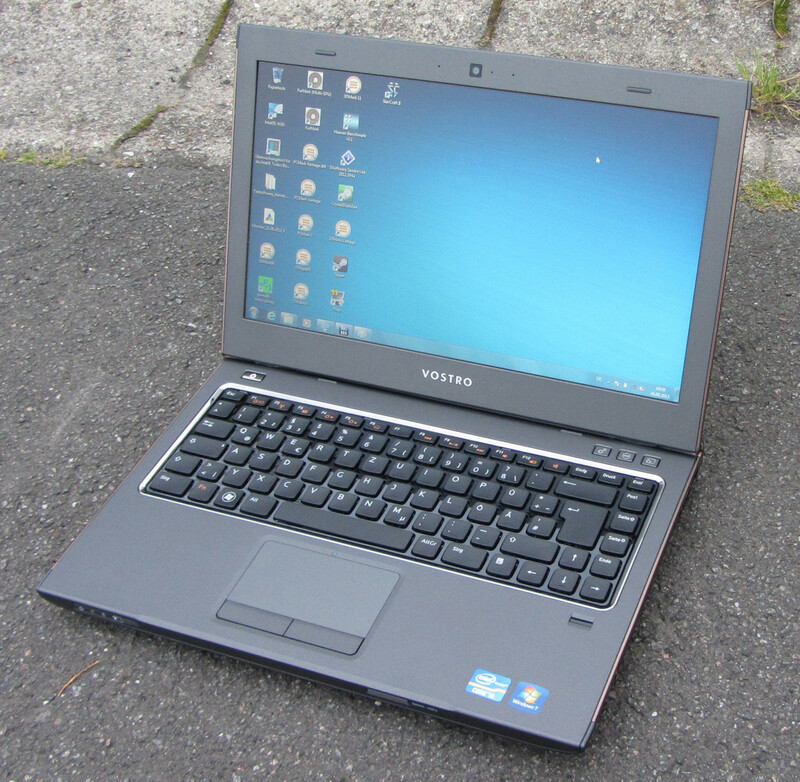 We tested the 14-inch Vostro 3460 model here. If you prefer small or big screens, you'll find a 13.3-inch Vostro 3360 or 15.6-inch Vostro 3560 laptop in Dell's assortment. Our test device is powered by Intel's dual-core i5-3210M processor. The processor has 4 GB of working memory available. The video output is divided between Intel's HD Graphics 4000 GPU and Nvidia's GT 630M GPU. Data is stored on a 500 GB hard drive. The laptop also harbors a DVD burner. Its contenders are the previous Vostro 3450 model (Intel Core i5-2410M, AMD's Radeon HD 6630M) and Lenovo's Thinkpad Edge S430 (Intel Core i5-3210M, Nvidia's GeForce GT 620M). Dell sells the laptop via its own online shop where the customer finds configuration options. The price starts at 479 Euros (~$622). 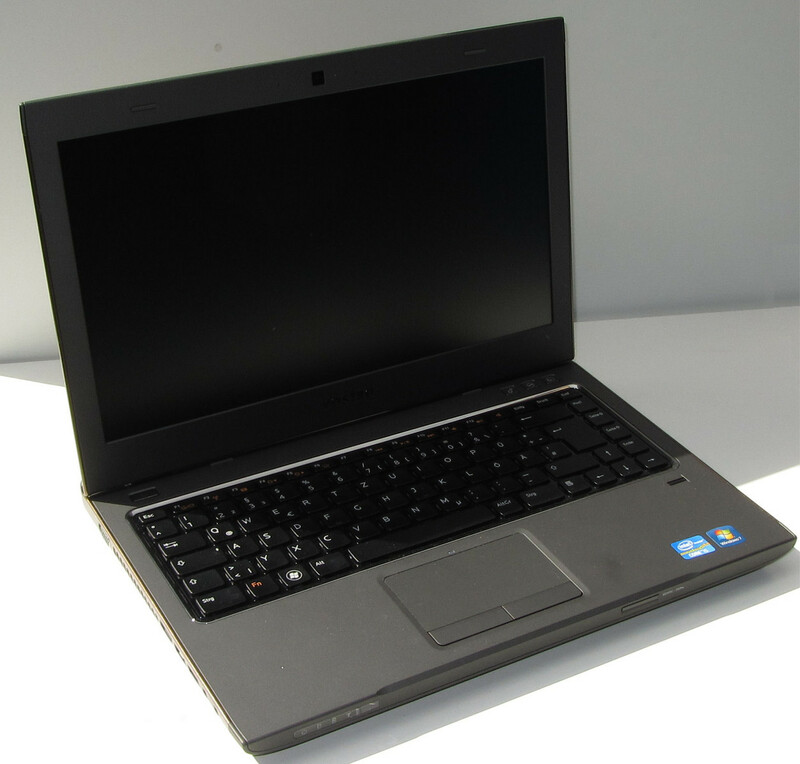 This price includes an Intel Core i3 2370 processor, 4 GB of RAM, a 320 GB hard drive and a DVD burner. Alternatively, Dell also offers pre-configured devices in retail – as for example our test device. Our test device is currently price-tagged at around –750-800 Euros (~$974-$1039). 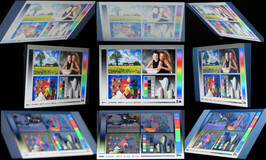 For example, the online shop, Cyberport.com, sells the silver model for 769 Euros (~$999). Dell has not altered the case's basic design compared with the Vostro 3450. The base unit's sides and the lid's back have the same color - copper brown in our case. Dell also has red and silver available. The base unit's top, front, back and the display bezel are gray. All surfaces on the laptop are matte - even the display bezel. 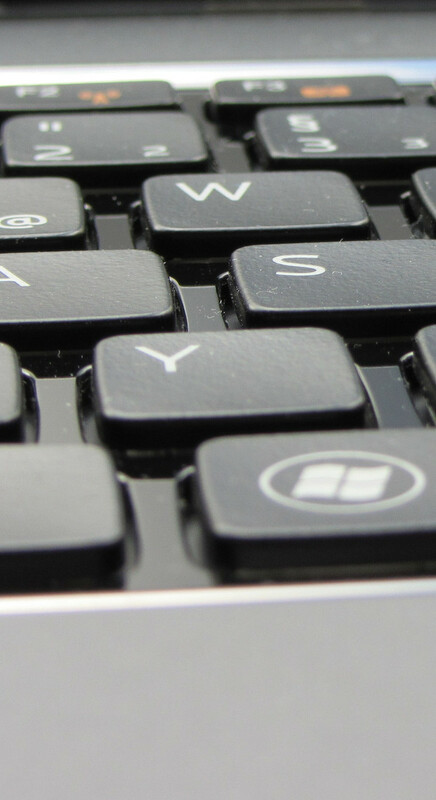 The gap between the keys and the keyboard's silver rim however are the exception. The base unit's top and the display bezel feature a light rubber coating, which makes these areas largely resistant to fingerprints. Overall, the used materials have a high-end feel. The Vostro 3460 is on a par with its precursor in terms of stability. The chassis hardly yields under pressure, not even above the optical drive. However, the Vostro 3460's keyboard yields a bit more to applied force, like in the Vostro 3450. The notebook hardly warps when it's lifted at opposite corners. The build is not quite as good as in the Vostro 3450. The gaps are not always completely even. The front right edge does not stand stably on the surface. This gets worse the further the display lid is opened. We cannot say whether this is a unique problem of our test device or whether it is a general problem of all Vostro 3460 laptops. The Vostro 3460's lid warps easily. The hinges keep the lid firmly in position. Opening it with one hand is possible. However, the lid should be opened slowly because the laptop would otherwise lift from the surface. Quite a few modifications have been made in the field of connectivity in contrast to the Vostro 3450. Both a VGA out and HDMI port are on the Vostro 3460's left. Moreover, you'll find two USB 3.0 ports and two audio jacks (headphone, microphone). 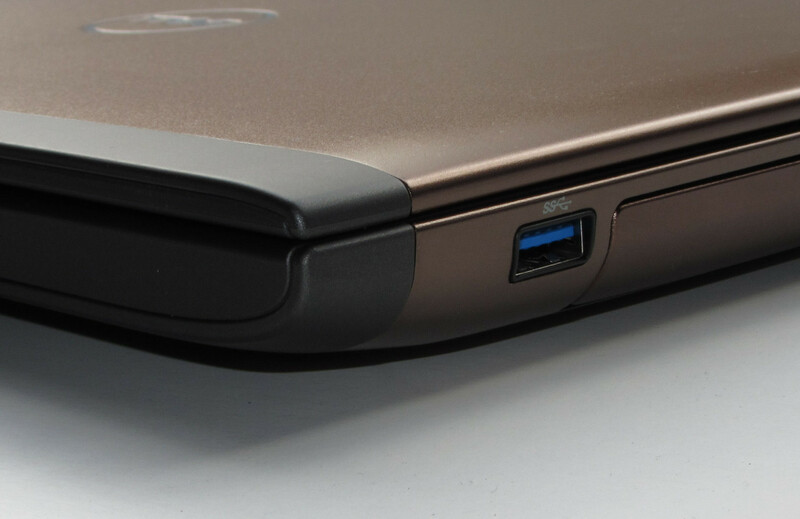 The laptop's right provides a third and fourth USB 3.0 port. The Gigabit Ethernet socket is also here. The rear harbors the power socket and the slot for a Kensington lock. The card reader (SD, MMC, Memory Stickand Memory Stick Pro) is now on the front. An Express Card slot is no longer available, which is too bad because an expansion option is unnecessarily lost with that. 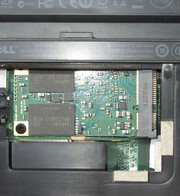 Dell's laptop builds up a cabled connection to the internet via an Atheros AR8161/8165 Gigabit Ethernet chip. Intel's Centrino Wireless-N 2230 WLAN module connects to wireless networks. The module supports the 802.11 b/g/n standards, as well as Bluetooth standard 4.0. A webcam is also installed. As usual, the webcam is located in the display's bezel. Some Vostro 3460 models also sport a UMTS module, which our test device does not feature. Dell's Vostro 3460 does not include many security features. Dell delivers the laptop with a fingerprint scanner. It belongs to the standard equipment of all Vostro 3460 models. The reader can be used with the preinstalled Digital Persona Fingerprint software, which enables accessing Windows as well as securing Web services via the user's fingerprint. Beyond that, the software facilitates encrypting data. The corresponding entry has already been added to Windows' context menu. The compulsory Kensington lock opening is also available. However, there is no TPM chip. Dell does not include many accessories for the Vostro 3460. In addition to a few manuals, there are several DVDs in the laptop's box. Dell includes the entire preinstalled software in form of DVDs, including the operating system. This is rare nowadays. Our test device is delivered with Windows 7 Professional (64 bit) preinstalled. Other Vostro 3460 models come with Windows 7 Home Premium. CyberLink PowerDVD 9.5, Digital Persona Fingerprint software, Microsoft Office 2010 Starter, Skype, Windows Live Essentials 2011 are also preinstalled on the hard disk. A few Dell tools are also found on the hard disk. Worth mentioning is Dell's Support Center that can be opened via a dedicated button above the keyboard. Dell's Support Center provides information about all areas of the computer - for example warranty status, hardware status, software status, manuals and much more. 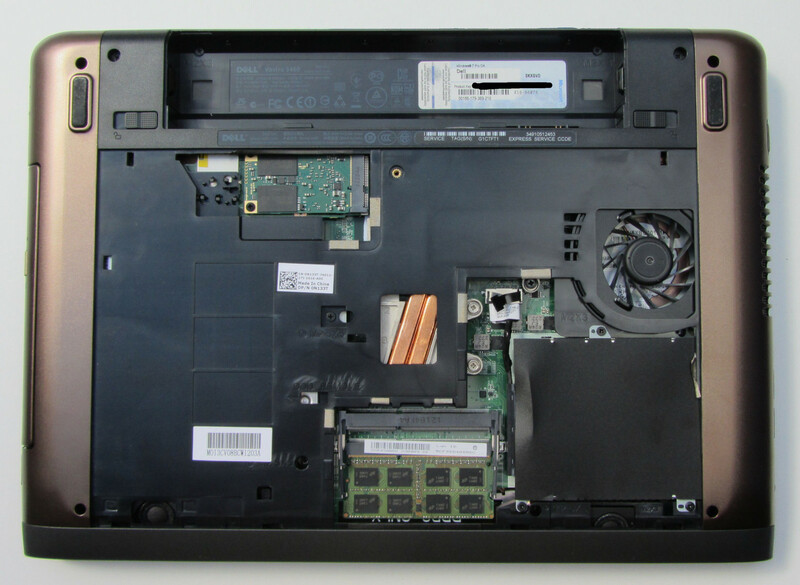 A large maintenance cover on the laptop's bottom conceals most components. 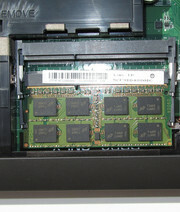 The Vostro 3460 sports two RAM banks. Merely one of the banks is occupied by a 4 GB module in our test device. Upgrading to 8 GB is accomplished quickly and easily. A 4 GB module currently costs around 20-25 Euros (~$26-$32). 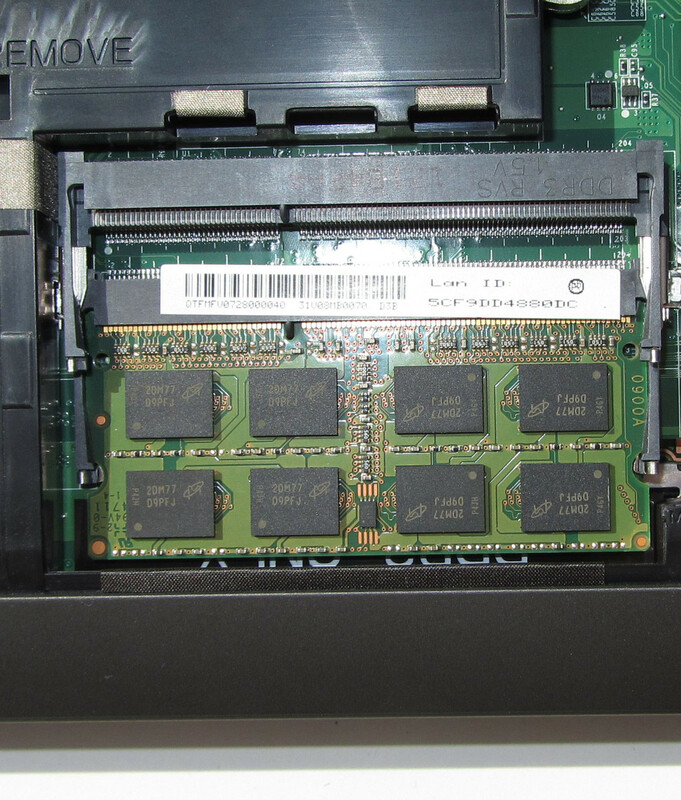 That would also be the maximum possible as the Vostro 3460 supports 8 GB working memory at most. This is incomprehensible because the option of upgrading up to a maximum 16 GB should be standard nowadays - particularly in a business device. The hard drive is also underneath the maintenance cover. It can easily be removed and replaced by another model. It is also possible to clean the fan. And finally, the user also has full access on the WLAN module. Our test device has a 24 month on-site warranty including ProSupport. 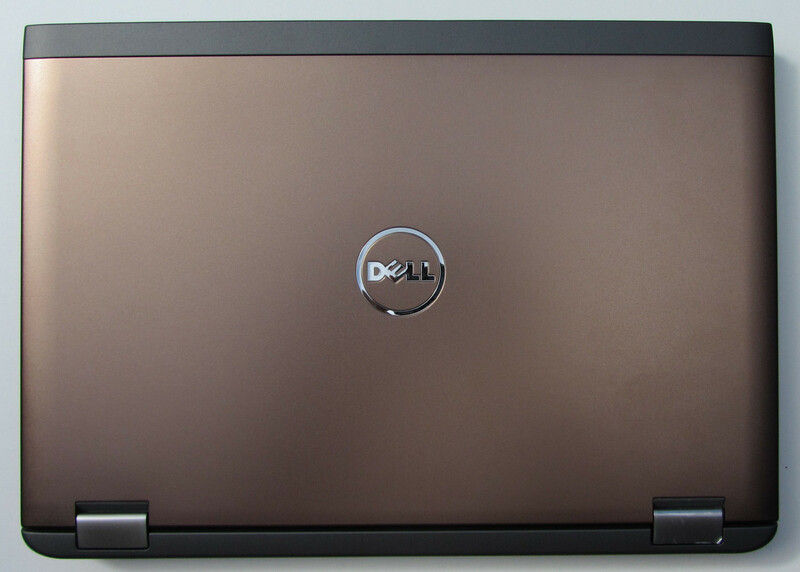 A Dell technician would come to the customer in warranty cases. The user gets a one year on-site warranty with basic support when the Vostro 3460 is bought directly from Dell. The warranty periods can also be extended. 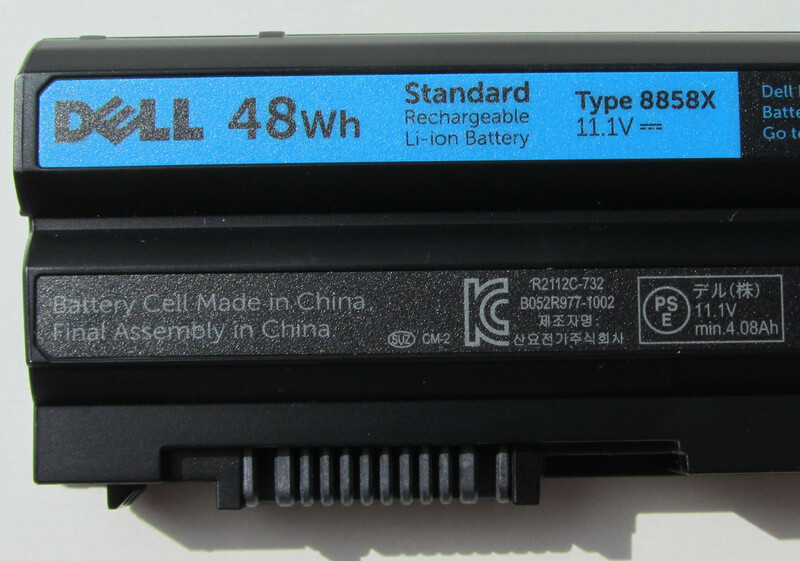 For example, Dell offers a three year on-site warranty including ProSupport for 90 Euros (~$117). The keyboards in the Vostro 3450 and Vostro 3460 are virtually identical. The Vostro 3460 features a chiclet keyboard. The main keys have a size of 14 x 14 mm and the gap between the keys is 4 mm. The key drop and stroke are on a par with the Vostro 3450. We are satisfied with both units. 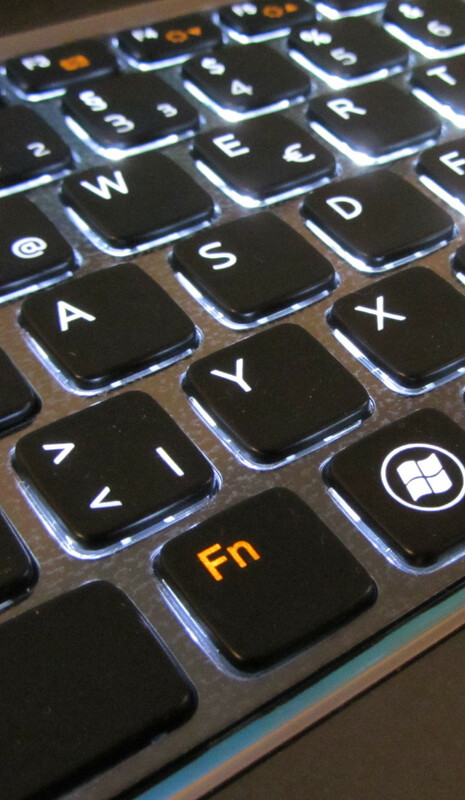 Overall, the Vostro 3460's keyboard enables pleasant typing. It also sports a key light, which is turned off automatically when not used for a short time. The light can be set to three levels: bright, dim and off. However, it does not feature automatic brightness control. According to Dell, the keyboard is spill-resistant. 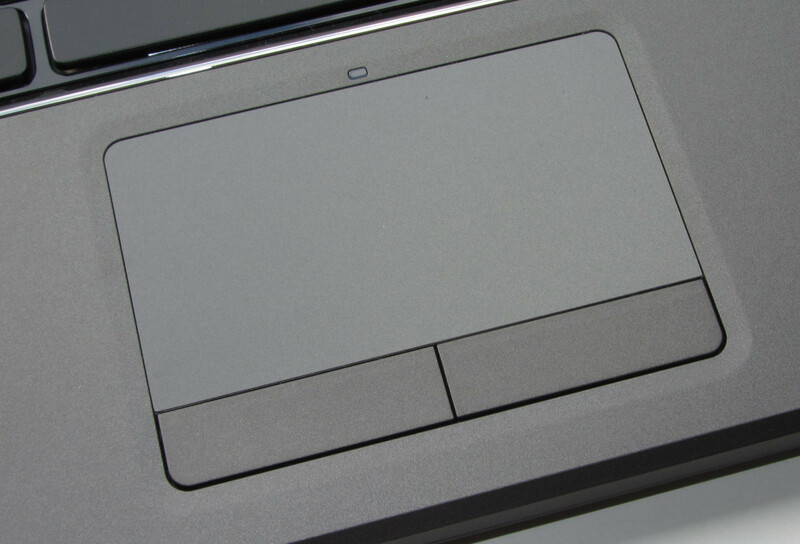 The touchpad's size of 90 x 49 mm is bigger than in the Vostro 3450 (84 x 41mm). Moreover, the Vostro 3460's metal rim is painted. Otherwise, both touchpads are similar. The Vostro 3460's roughened surface ensures good gliding traits and it is possible to easily navigate with the finger. We were disappointed about the poor click sensitivity. We had to tap the touchpad with a bit more force before the click was detected. 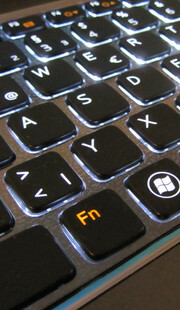 The touchpad features multi-touch functions and thus allows gesture controls such as two-finger zoom. Both mouse keys are implemented below the touchpad and have a clearly palpable pressure point. As in the Vostro 3450, Dell again installs a matte 14-inch screen in the Vostro 3460. The screen features a resolution of 1366x768 pixels and an LED backlight. Regrettably, Dell uses a much darker screen in the Vostro 3460. We ascertained an average brightness of 149.8 cd/m2. 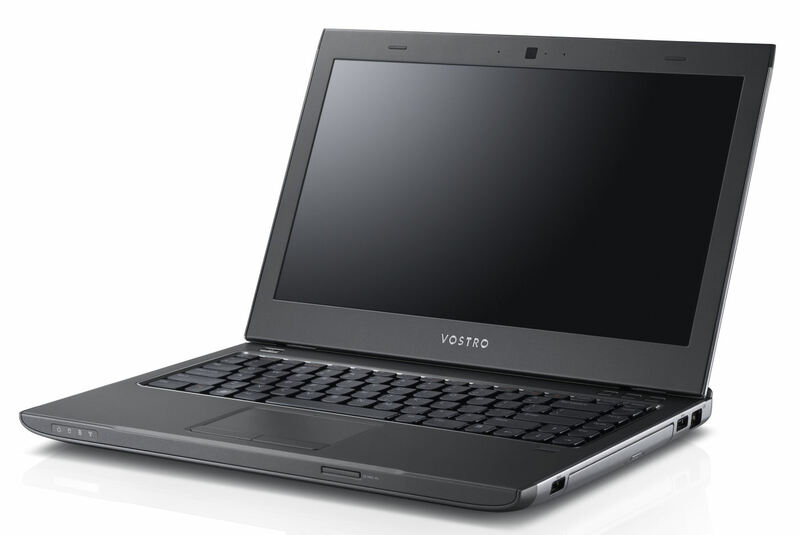 The prior Vostro 3450 model achieved a rate of 224.1 cd/m2. Even the Thinkpad Edge S430 reached a better result with 215.9 cd/m2. The Vostro 3460's screen illumination of 89% is on a par with both the Vostro 3450 (87%) and Thinkpad Edge S430 (88%). Dell does not offer higher resolution displays for the Vostro 3460. The Vostro 3460's black value of 0.97 cd/m2 is better than in the Vostro 3450 (1.6 cd/m2) and Thinkpad Edge S430 (1.33 cd/m2) and places it in the midfield. In addition to the average if not low black values, all three laptops fail to supply breathtaking contrast rates either: Vostro 3460: 159:1; Vostro 3450: 147:1; ThinkPad Edge S430: 169:1, and are not far apart. Thus, Dell's Vostro 3460 is not suitable for professional graphic design or image processing. 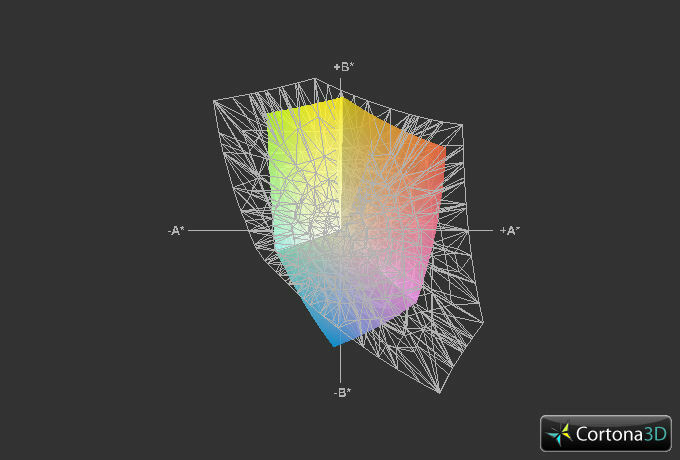 The screen can neither reproduce the sRGB nor the Adobe RGB color space. Despite the low brightness and poor contrast, the Vostro 3460 makes a good impression in outdoor use. The screen's matte surface pays off here. Nevertheless, direct sunlight should be avoided because the screen cannot outshine the sun. The Vostro 3460's viewing angle stability is on the expected level. The picture distorts quickly when the screen's vertical viewing angle is changed, unlike the horizontal viewing angle where the picture remains stable over the entire angle. The Vostro 3460 is interesting as both an office device for the business field as well as for home use. The laptop's equipment is apt for standard application scenarios, so Web browsing, emails, video telephony and word processing. If you opt for a version including Nvidia's dedicated GeForce GT 630M GPU, you also get a device suitable for computer games. A model featuring a UMTS module is available for users who require a permanent internet access wherever they may be. Our test device is equipped with a dual-core i5-3210M processor from Intel's Ivy Bridge processor generation. The CPU's default clock speed is 2.5 GHz and can be increased to 2.9 GHz on both cores and 3.1 GHz on one core. The technology behind this is called Intel Turbo Boost. The CPU cores are accelerated automatically. Both CPU cores ran at full speed (2.9 GHz) for roughly 6-7 minutes during our stress test (Prime95 and Furmark running simultaneously). Then the clock speed dropped to 2.5 GHz and remained permanently at this rate. It looked the same for the GPU. The graphics chip started with the maximum clock of 800 MHz and occasionally dropped to 760 MHz after 6-7 minutes. The GPU ran at this speed permanently after roughly 10 minutes. The CPU throttled on battery power. Both CPU cores exhibited a clock speed of between 800 and 900 MHz most of the time. The clock occasionally increased up to 1200 to 1300 MHz. The GPU permanently ran on its default clock of 662 MHz. This looked different in the Cinebench tests. We always measured the full CPU clock speed of 2.9 GHz in both AC mode as well as on battery power. Ergo, the Cinebench results are on a par with other laptops using Intel's Core i5-3210M processor, such as the Thinkpad Edge S430. The Thinkpad cannot keep up with the Vostro 3460 in the GL test because it has a weaker GPU (Nvidia's GeForce GT 620M). However, the Vostro 3460 beat the Vostro 3450 (Intel Core i5-2410M) in every test. The system runs smoothly and quickly. It responds swiftly and without delay to inputs and program executions. It could be faster by replacing the hard drive with a solid state drive. The PCMark benchmark scores are on the expected level. 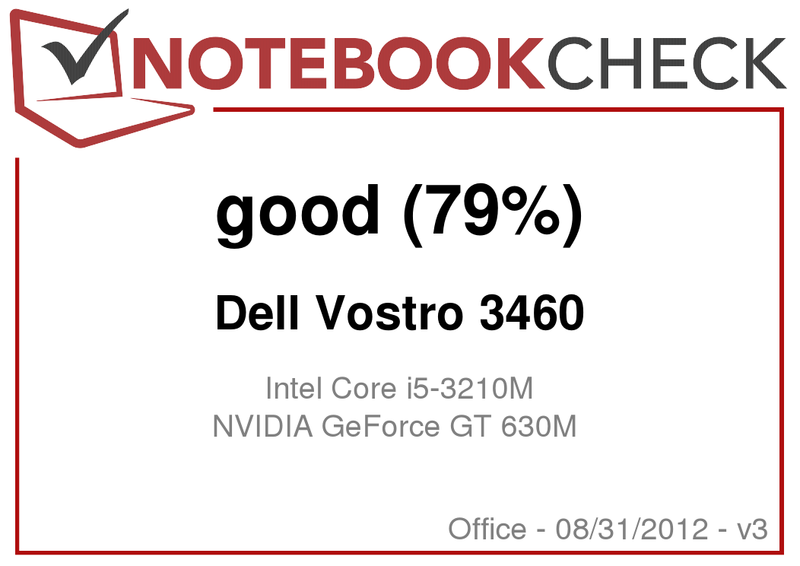 Dell's Vostro 3450 is clearly defeated in both PCMark tests. The Thinkpad S430 has a slight lead on the Vostro 3460 in the PCMark Vantage test. In return, the Vostro 3460 clearly wins the PCMark 7 test. Dell installs a conventional hard drive from Seagate's Momentus 7200.4 series into our test device. The drive spins with 7200 revolutions per minute and contributes a total memory capacity of 500 GB. That is more than enough for innumerable pictures, music tracks and videos. Samsung's PM830 solid state drive supports the conventional hard drive. It acts as a cache and the user does not have direct access on the SSD. The hybrid system is within a normal range for 7200 rpm drives with an average transfer speed of 91.6 MB/s. It can be generally said that the hard drive is not a bottleneck for the system. The read rate shows the speed increase caused by the SSD. It is within a good range due to approx. 140 MB/s. Dell's Vostro 3460 is an office laptop. Here speed is more important than the biggest possible memory capacity. Thus, we would recommend a solid state drive with a memory capacity of 120 GB for the laptop. However, should a larger amount of memory be needed, we would recommend a hard drive that spins with 7200 rpm. Dell has something to suit everyone in its range. According to Dell's website, conventional hard drives with memory capacities of up to 750 GB and solid state drives with capacities of up to 128 GB are available for the Vostro 3460. Two graphics chips are responsible for video output - Intel's HD Graphics 4000 integrated in the Core i5 processor and Nvidia's dedicated GeForce GT 630M graphics chip. Both GPUs work collectively. 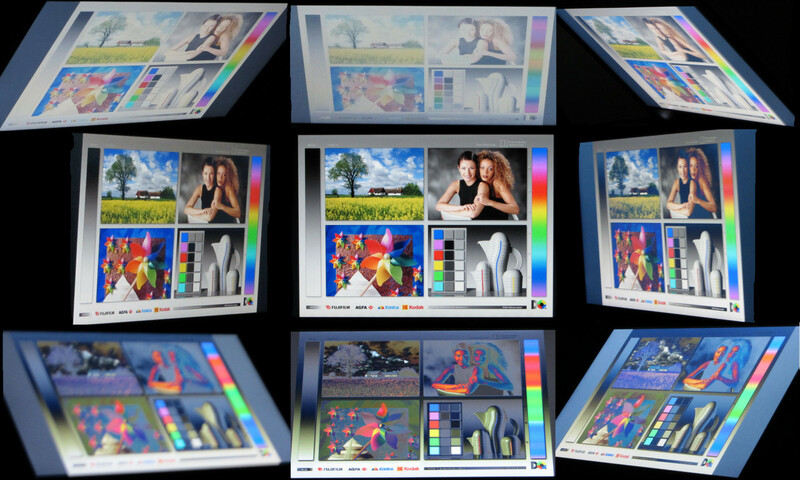 The graphics chip most suitable for the actual task is always used. For example, Nvidia's graphics chip is normally used when maximum processing power is needed, e.g. complex computer games. Basically, both GPUs can take care of every task. 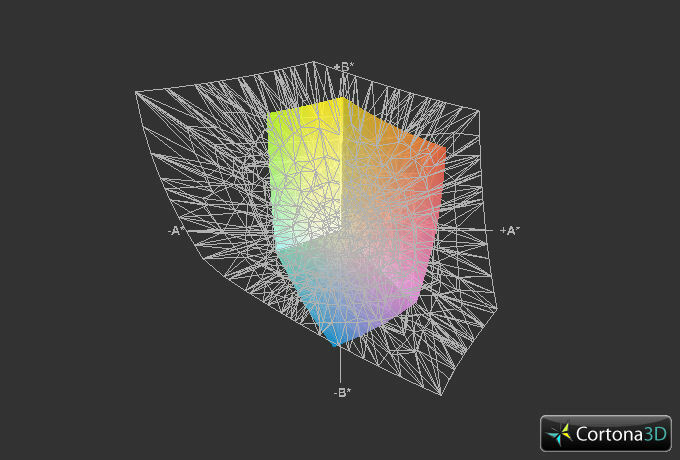 However, every task is assigned to one GPU via GPU profiles. When required, the user can modify or add new profiles. GPU switching is fully automated and happens in the background. This technology is called Nvidia Optimus. Nvidia's GeForce GT 630M graphics chip is a midrange model and supports DirectX 11. The default clock in the Vostro 3460 is 662 MHz. Dell enables a turbo speed of up to 800 MHz during load. Moreover, the GPU has a dedicated working memory of 1 GB. Intel's processor integrated HD Graphics 4000 takes over video output in routine operations. The chip also supports DirectX 11. The chip's processing speed is variable between 350 and 1100 MHz. Its default clock speed is 650 MHz. Nvidia's GPU ran with its full clock of 800 MHz for a few minutes in our stress test (Prime95 and Furmark simultaneously). Later, the clock dropped to a permanent 760 MHz. The turbo speed was not used at all on battery power. The GeForce GT 630M GPU ran stably at 662 MHz. The results of various 3DMark benchmarks were on the expected level. 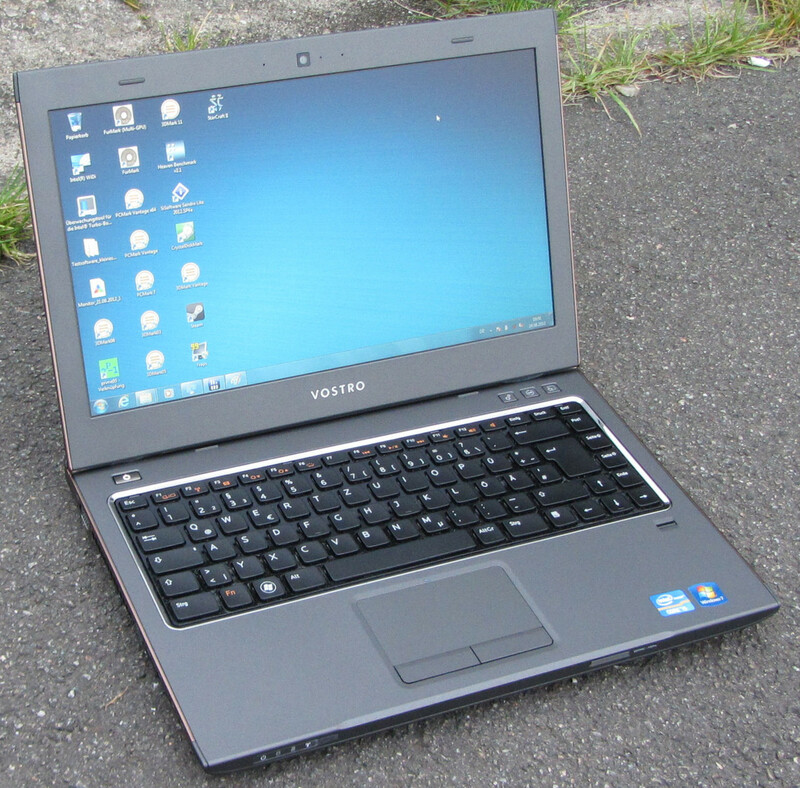 Both the Vostro 3450 and Thinkpad Edge S430 were defeated in every test. Nvidia's GeForce GT 630M GPU installed in the Vostro 3460 allows playing complex computer games. The results of the different 3DMark versions already imply that the Vostro will be capable of this. This is verified in practical use. The games we tested ran smoothly in medium quality settings and the native resolution of 1366x768 pixels. Most games even ran smoothly in high quality settings. The Vostro 3460 is not a quiet laptop. We measured between 36.5 and 39.9 dB just during idle mode. These rates are already in a disturbing range. However, the Vostro 3460 did not generate this noise level permanently and was generally also quieter. Nevertheless, the fan ran continuously. It was even louder during full load (Furmark and Prime95 running simultaneously). Here, we measured a noise of 46 dB. With 45.4 dB, it did not look much better during moderate load either (3DMark 2006). These rates are too high on total. The Vostro 3460 is an office device and concentrated work requires silence. The prior Vostro 3450 did a somewhat better job here and emitted less noise over the entire load range. Both Dell laptops cannot in the least compete against the Thinkpad Edge S430. Lenovo's laptop is still within a quiet range with just 33.3 dB during load. The temperatures remained within an acceptable range in idle mode. The laptop reached temperatures between 29 and 37.2 °C on both the top and the bottom. These temperatures enable pleasant working and it is possible to place the device on the lap without hesitation. The temperatures increased to between 31 and 50 °C - depending on the measuring point - during full load. We measured temperatures of 50 °C in the measuring points above the heat sink. The wrist rest's temperature was also slightly over 30 °C during full load. The touchpad heated up to 48.4 °C. In contrast to the Vostro 3450, the temperatures have increased, particularly during load operation. The Vostro 3450 was always far below 40 °C. The Thinkpad Edge S430 performed even worse during the full load test and reached temperatures of up to 60 °C. The CPU's processing speed dropped from 2.9 to 2.5 GHz after a few minutes of stress testing (Prime95 and Furmark running for at least one hour) and remained at this clock speed. Nvidia's GPU exhibited a similar behavior. Its speed dropped from 800 to 760 MHz after a few minutes. The CPU throttled on battery power and ran with a clock speed between 800 and 900 MHz. It occasionally increased to 1200 to 1300 MHz. Nvidia's GPU permanently ran on its default clock of 662 MHz. The temperatures settled to 90 °C. (-) The average temperature for the upper side under maximal load is 41.9 °C / 107 F, compared to the average of 29.4 °C / 85 F for the devices in the class Office. (±) In idle usage, the average temperature for the upper side is 34 °C / 93 F, compared to the device average of 29.4 °C / 85 F.
(-) The palmrests and touchpad can get very hot to the touch with a maximum of 48.4 °C / 119.1 F.
(-) The average temperature of the palmrest area of similar devices was 28.2 °C / 82.8 F (-20.2 °C / -36.3 F). 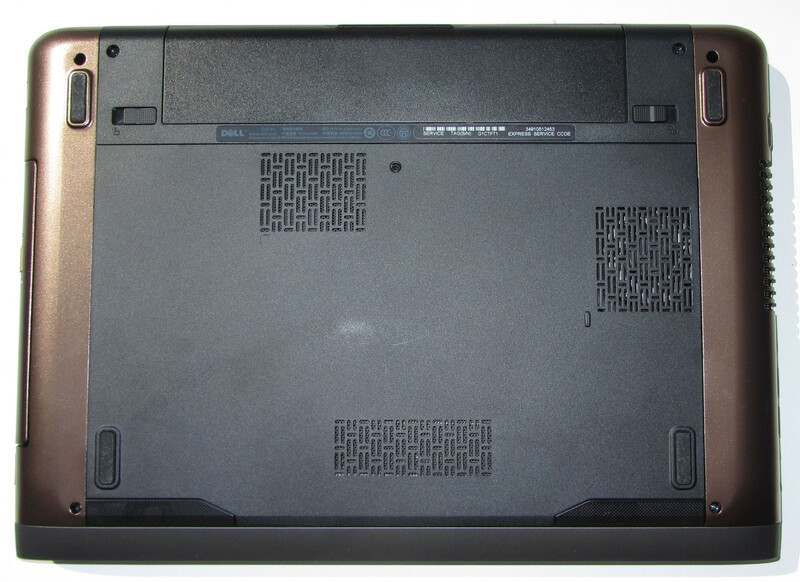 The Vostro 3460's speakers are located on the laptop's bottom. There is an audible improvement compared with the Vostro 3450. The speakers produce a pleasant soundscape and even speech is intelligible. The speakers are more than sufficient considering that this is an office device. Should you not like its sound, it is always possible to connect external speakers or headphones to the laptop. The idle power consumption could be better. We ascertained a consumption of 9 to 14.9 watts in idle mode. That is on a par with the Vostro 3450. Lenovo's Thinkpad Edge S430 is much more energy-efficient with 7.3 to 11.9 watts. As soon as full performance was demanded from the Vostro 3460 (Prime95 and Furmark), the power consumption increased to 64.4 watts. Interestingly, it is not the maximum power consumption that we measured. The Vostro 3460 consumed 66.6 watts during medium load (3DMark 2006). When only Furmark was running, the power consumption increased to 71.6 watts. The latter is very baffling since the CPU's clock was only 1.2 GHz. It seems that the power consumption is always high when the GeForce GT 630M GPU runs at full speed. Both the Vostro 3450 and Lenovo's Thinkpad Edge S430 consume less power during full load. The Vostro 3460 achieved a runtime of 5:44h while idling (Vostro 3450: 3:52h; S430: 6:43h). We tested the idle mode via BatteryEater Reader's test, where the screen is set to minimum brightness, the energy savings profile is enabled and the wireless modules (Wi-Fi, Bluetooth) are disabled. The Vostro 3460 managed a runtime of 1:15h during load (Vostro 3450: 1:00h; S430: 1:26h). BatteryEater's Classic test was used for the load test. Here, the screen is set to maximum brightness, the high-performance profile and wireless modules are enabled. One battery charge lasted for 3:52h in the Wi-Fi test (Vostro 3450: 2:47h; S430: 3:51h). Websites are automatically opened every 40 seconds in this test via a script. The energy saving mode is enabled and the screen's brightness is set to approximately 150 cd/m2. The Vostro 3460 lasted for 3:22h in the DVD test (Vostro 3450: 2:38h; S430: 2:35 h). That is enough for two movies. The wireless modules (Wi-Fi, Bluetooth) are disabled and the screen is set to maximum brightness for the DVD test. We used the energy saving profile or a higher profile (should the DVD not be rendered smoothly) in this test. Interestingly, the Vostro 3460 exhibits much better run times than the Vostro 3450 although the batteries in both devices have the same capacity. The Vostro 3460 is much more energy-efficient, although it consumes a lot more power at its peak than the Vostro 3450. The Thinkpad Edge S430's idle and load runtime are better than those of the Vostro 3460. In return, the Vostro 3460 has the lead in the practical Wi-Fi and DVD tests. Dell has released an office device that easily outdoes the Vostro 3450 precursor in terms of performance. It supplies more power and better battery run times. However, this takes its toll on noise and temperature development. The noise could actually be a make and break criterion for many buyers. The fan runs continuously and recurrently achieves annoying noise levels. If you are interested in this laptop you should compare it with a model devoid of an Nvidia GPU and/or weaker CPU. It is likely that laptops with this equipment will not produce as much noise. We also have to mention the fairly dark screen here. It can be strenuous to gaze on a dark screen over a longer period. If you can live with these drawbacks, the Vostro 3460 will be a solid office device for everyday use - like the Vostro 3450 already is. Our test device was delivered in a copper brown color. The keys are pleasantly sized. ...and the DVD drive can be removed. The WLAN module is also underneath the maintenance cover. It would be easy to replace the hard disk. A large maintenance cover is on the laptop's bottom. The DVD drive reads and writes every kind of DVD and CD. The key light can be set in three levels. Four USB 3.0 ports aren't seen every day. The matte surfaces of both the chassis and the display are pleasing. A two year, on-site warranty is also unusual for this price range. Contenders are found in Dell's prior Vostro 3450 model and Lenovo's Thinkpad Edge S430.